You might well know Zeisl's name even if you have not heard any of his music. Back in the mid-1990s his Requiem ebraico was included on a Decca Entartetemusik disc on which the main work was Franz Waxman’s Song of Terezin. Viennese-born composer Zeisl had his centenary last year (2005) when the present recording was made. His name and reputation is recondite but the web is rich with biographical references. The Schoenberg site is eminent amongst these. Do have a look at http://www.schoenberglaw.com/zeisl/. Zeisl’s first songs were published in 1921 after which many more followed and were performed in Vienna. Anti-semitic pogroms left him with no choice in 1938 but to leave the city, first for Paris and then for the USA. He ended his days in the Los Angeles area amid the large expatriate artistic community there. In her notes for the present CPO release Barbara Schönberg stresses the core importance of song in Zeisl’s life and catalogue. Of those included here eleven were published during the composer's lifetime. They are in direct line to Schubert with only the most gentle colouristic touches of expressionism betraying their twentieth century origin. The range is wide: from the gently imploring Vergissmeinnicht to the dew pristine Lehár-like ecstasy of Vor meinem fenster; the latest song here, dating from 1936. Goethe's The Shepherd weaves off-key impressionism into a cheery melody. Armseelchen is mournful and fantastic. The pianola style, picked-out and playful Der Weise, is memorable and so is the possessed mania of Nietzsche's Ecce Homo barked and hammered like an aria from an opera manqué. Typically cloud-hung and fearfully charged with foreboding is Nachts. Then again there are simple clever ringing tunes like Im frühling. The last song of his cycle Mondbilder, setting words by Christian Morgenstern, is memorable for its convulsive piano figuration illustrating the cherub whose flight is like that of a golden boomerang. These songs were written between 1925 and 1936 so none date from his American years. The Ezust site (Texts: http://www.recmusic.org/lieder/z/zeisl.html) provides lyrics and translations but, as is usual with the ever sedulous CPO, the texts and translations into English are in the booklet. Zeisl’s is a lyric voice touched lightly with expressionism and owing far more to Lehár than to Schoenberg. Both Holzmair and Garben superbly complement the romantic-expressionist moods of these extremely attractive songs. This music recalls that of another fluchtling: Hanns Eisler in his Hollywood Song Book; Mathias Goerne recorded these for Decca in 1997. 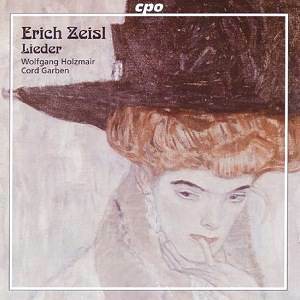 While Eisler's style in lieder is nostalgically Schubertian Zeisl adds a light dusting of modernism and angst.